Syrians who wanted an end to regime dominance knew the rules when they started demanding changes in the region’s most uncompromising police state in March last year. Now, 18 months and more than 23,000 bodies later, and with no end in sight to the chaos ravaging the country, their worst fears are being realised on a scale that continues both to horrify and numb. With all of Syria’s cities now under siege, its capital Damascus and commercial hub Aleppo engulfed in violence, Syria seems well past that proverbial point. Defections have whittled down the strength and numbers of the country’s vaunted military and destruction and misery is seriously testing the resolve of both regime supporters and those who want Bashar al-Assad gone. The country’s economy has been under the anaconda-like grip of international sanctions, which have ground industry to a halt, crippled trade supply lines, battered the currency and shattered confidence. In the hard-hit north, little works any more. War has seen Syrian society, already stuck – seemingly permanently in 1973 – wound back even further. There are more donkey carts than cars on the streets of some towns between Aleppo and the Turkish border. Clapped-out tractors belch fumes from precious fuel that is sold in two-litre bottles on rubbish-strewn roadsides for around $8 (£5). Abu Nour is now a foot soldier in the rebel army that is at the vanguard of the fight for Syria’s destiny. Drawn largely from the rural poor, and also represented by conservative Islamic groupings such as the Muslim Brotherhood, the FSA has taken the battle to the country’s two lead cities, where it is now engaged in a fight to the death with the regime army. Rebel groups entered Aleppo and Damascus in mid-July and their early gains sparked predictions that four decades of uncompromising rule was about to end. But as a withering summer draws to a close across the northern plains that have harboured Aleppo, and the central plateau on which Damascus, the world’s oldest capital has stood for more than 6,000 years, this early optimism has yielded to a more unpalatable reality – that neither side is about to secure a decisive victory in either city anytime soon. The soaring death toll this week in Damascus, where more than 300 people were reportedly killed in one day alone, and the grinding misery in the battlefield suburbs of Aleppo, have left many in Syria – and in the rest of the ever-more restive region – wondering what comes next. Were he to try to cut a deal with Syria’s fractious opposition groups or to capitulate to their demands, the downside for Assad and the regime he inherited from his father is obvious. Also increasingly clear, even to lay observers, is the scale of the risk to Syria’s neighbours if the civil war continues to expose regional fault lines that have remained unaddressed throughout the modern history of the region. After the 500-year Ottoman empire disintegrated more than 90 years ago, the borders of Syria, Iraq, Lebanon, Jordan and what was to become Israel were defined – often on imperial whim. The pact between Britain and France that led to Syria’s independence, known as the Sykes-Picot agreement, cobbled together various sects under the banner of nation states, which have not coexisted easily. For more than 40 years, the Alawite sect, which is loosely aligned to Shia Islam and had long been persecuted under the Ottomans, has been used to solidify regime control. Most of the key regime figures, including the Assads, have been Alawites ever since Bashar’s father, Hafez al-Assad, was at the peak of his powers. Despite comprising around 12% of Syria’s population, the Alawites dominate the Syrian establishment and hold most key positions in the military and security apparatus. Now, as Syria wobbles, the sect feels a deep sense of threat from the country’s majority Sunnis, some of whom hold grudges against the regime because of its treatment towards them before the uprising. “Egypt and Libya have taught us that the way that power works [now] in Syria does not have to be the way it will always be,” said Mohammed Hariri at one of Aleppo’s frontline zones earlier this month. A realignment of power appears to be top of the wish list for many fighters and residents alike in Syria’s opposition strongholds. But such a shift will not be contained within Syria’s borders – a fact that is causing increasing alarm outside the country and fuelling fears that changes more profound than anything since the fall of the Ottomans are starting to take place in the Middle East. Along with Jumblatt, other Lebanese leaders broadly aligned to the west or Saudi Arabia have been laying low this summer. The country’s former prime minister, Saad Hariri – whose father, the Lebanese elder statesman Rafiq Hariri, was assassinated in 2005 – has been in self-imposed exile in Riyadh and Paris for the past 18 months. Samir Geagea, a political ally of the Hariri, who leads a prominent Christian political bloc, survived a failed attempt by a sniper to shoot him in his garden in June. The arrest earlier this month of Lebanon’s former information minister, Michel Samaha, a key ally of Bashar al-Assad, has given weight to the fears that assassins are lurking. Samaha has been charged with receiving explosives and instructions from Syria’s national security chief, General Ali Mamlouk, allegedly with the knowledge of Assad, to target 20 key figures in Lebanon. He was entrapped by a close aide who filmed him saying Assad was personally aware of the plans. His case is now before a military tribunal, a rare event in Lebanon, where state institutions have often failed to assert their independence. In Iraq, where assassins have remained a part of the political fabric for much of the past eight years, there is also a growing fear that the chaos in Syria cannot be contained. Islamist groups that wreaked havoc between 2004 and 2007 have announced that they are trying to reclaim ground they lost during fighting with US forces and militias that were at the time backed by the US and Iraqi governments. They claim to be drawing inspiration from the Syrian uprising, which has in part been joined by a new dynamic – jihadists from other parts of the Arab world, some of whom see the fighting taking place in Syria as part of a global jihad. 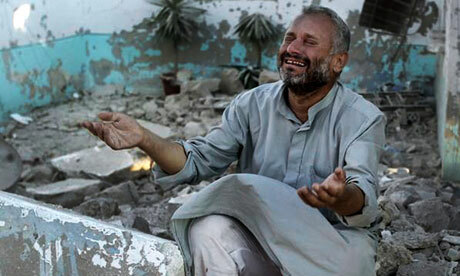 A man reacts after an airstrike on Azaz destroyed 10 buildings on 15 August 2012. 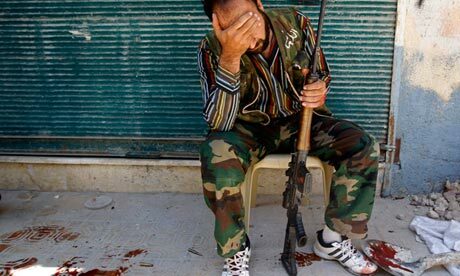 Photograph: APAs Aleppo has burned, the regime counter-assault in Damascus has been relentless over the past fortnight. The Syrian army has warned of “inevitable death” for rebel fighters who don’t put down their weapons in areas known as opposition strongholds. Anti-regime neighbourhoods say they have little reason to trust that pledges of amnesties will be honoured by a military that has shown no quarter in more than a year of battles with rebels. And, as sectarian positions harden, in an increasingly volatile region, there appears little reason for the regime to decide that now would be a time for compromise. Iran, which has viewed Syria as its key ally in the Arab world for much of the past 30 years, has shown signs of increasing belligerence as the situation in Syria has deteriorated. The fall of Damascus would be a serious strategic blow for Tehran, as it would for its key ally in Lebanon, Hezbollah, which has enjoyed staunch support and patronage from both regimes since 1982. Also unflinchingly in Syria’s corner is Russia, which has acted to prevent even more severe international sanctions or any move towards direct foreign intervention in the conflict. Russia’s ties to the Syrian regime date back to Soviet days and have, in many ways, post-dated them. Libya and Egypt had at times been in the Soviet sphere. Syria, meanwhile, has barely left it despite the end of the cold war more than 20 years ago. Late last month, in a grand villa in the Aleppo hinterland that belongs to the family of General Hikmat Shehabi, a former confidante of Hafez al-Assad who left Syria shortly after his son was named president, rebels thumbed through old books on a lounge room shelf. One had been signed by the late North Korean dictator, Kim Jung-il. There were also tomes in tribute to Assad Sr and eulogies to the achievements of Soviet society. Time had stood still in the dusty marble mansion, just as it had on the drab empty streets outside where this society in the north of a country deeply embroiled in revolution seemed collectively unsure about what to do next. In dozens of conversations the Guardian has had with Syrians in recent months – some diehard regime backers and others just as deeply committed to the opposition cause – a clear sense has emerged that the popular uprising that started it all in the southern city of Deraa has been dwarfed by something far more significant. The arc of revolution that started in Tunisia, surged through Egypt, then raged through Libya, has hit an obstacle in Syria, one that may prove difficult as a whole for the region to bypass. “History has hijacked what the people were trying to achieve,” says Amal Kuzbari, a Syrian teacher from Homs, now a refugee in southern Turkey. “It was simple at the beginning and it isn’t now. What will emerge from Syria’s civil war will likely take many months to determine. A rapid end to the regime would not mean an end to crisis. The vacuum that would follow the end of strongman rule would take some filling – the recent experience of Iraq to the east, another sectarian state bound together by an autocrat, clearly demonstrates that. Even states such as Turkey, with strong borders and robust institutions, will remain susceptible to Syria’s spillover effects. Turkey is now hosting around 40,000 Syrian refugees and said earlier this year that it has prepared contingencies for up to 500,000. However, if Syria’s Kurds decide that the crumbling of state authority gives them the chance to push their case for statehood, Turkey will be facing more than a refugee crisis.